2.Do not dispose of battery in fire as they may explode, battery may also exploded if damaged. Works in or Replaces Canon NB-6LH/6L;100% Compatible with the CANON PowerShot SX710 HS, SX530 HS, SX520 HS, SX510 HS, SX500 IS, SX700 HS, SX280 HS, SX260 HS, SX170 IS Black, SD1300 IS, SD1200 IS, SD980, SD770, SD1300, D30, D20, D10, IXUS 85 IS, IXUS 95 IS, IXUS 200 IS cameras. Capacity:1300mAh; Voltage:3.7V;Premium Grade A cell for longer battery life with no memory effect. 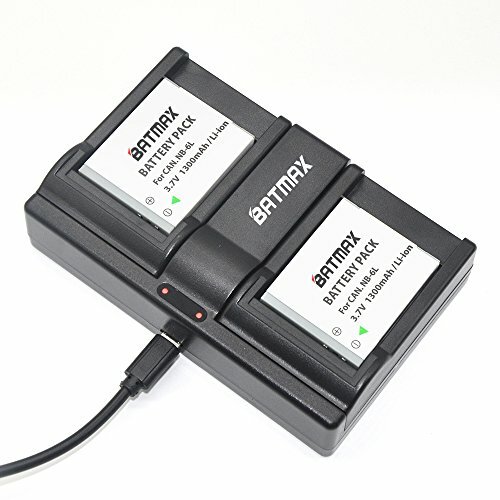 Batmax Products are CE certified, tested by manufacturer to match OEM products. If you have any questions about this product by Batmax, contact us by completing and submitting the form below. If you are looking for a specif part number, please include it with your message.